A war against the system- Fighting the odds! Mark Jeneker, an ex drug addict who has served time in prison has completely turned his life around and the fruits from his efforts are sweet and serving his entire community. The truth is, we are all mere products of the context that we were brought up in. We are groomed by our influences and experiences. Very little of “who we are” is a result of our genetic makeup or innate ability. That is what makes the saying “against all odds” hit home and hearts for situations like Jeneker. A system beyond our grasp as controlled the fate of so many subjected to it. It is time to fight the odds. As a result of a difficult childhood, exposed to gangsterism, violence and drugs from a very young age, Jeneker got caught in a rut but about five years ago, he decided to turn his life around. He sought out rehabilitation and through sobriety he realised that it was time do something life changing, not only for himself, but for all those, like him who were fighting the same odds. As art was always his passion, it was a no-brainer to use art and creative expression as the way out. 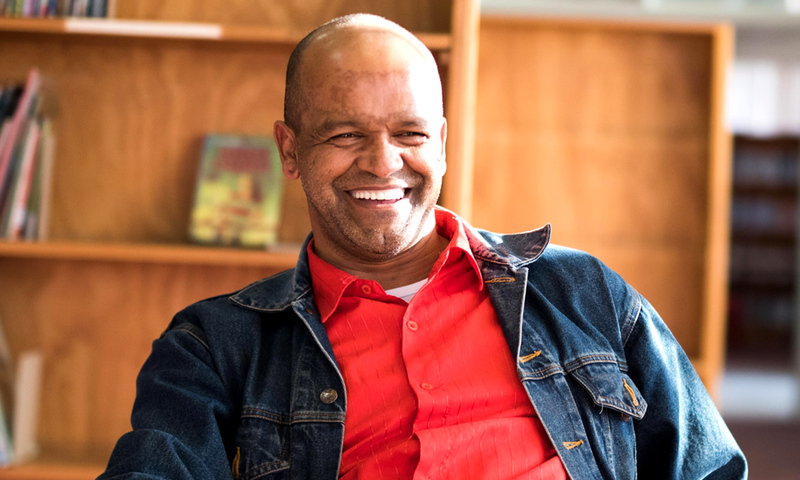 He set out to start in his hometown, Mitchell’s Plain, where he reached out to those who he thought needed it the most- primary school students who were often found loitering and experimenting with all sorts of bad habits just after school. 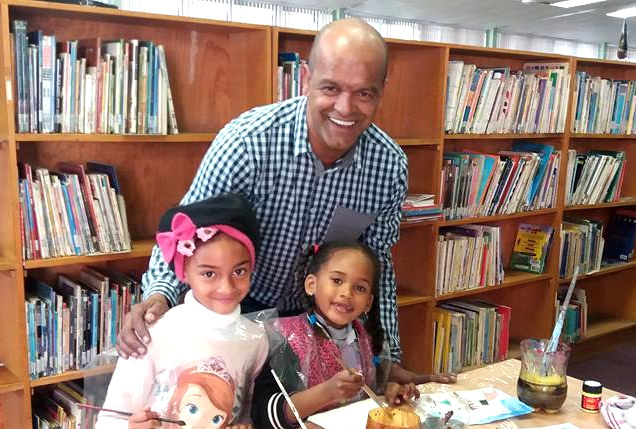 He now facilitates afterschool arts and craft programs around Mitchell’s Plain. He moves in between Yellowwood primary, Westville Primary and Mitchelle’s Plain Town Centre Library. He welcomes nearly 500 kids per week. Jeneker specializes in abstract art and creating 3D sculptures from recyclable material. He believes in the maximum that promotes “One man’s trash being another man’s treasure”. He up-scales what was once considered worthless waste into unimaginable things like dresses or humanistic robots. He has gone so far as to enter some of his participants in provincial art competitions. One of his students, Aaliyah (9 years) won a gold medal for one of her pieces which was exhibited at the Iziko South African National Gallery. His heroic effort has made headlines in numerous local newspapers such as People’s post, Plainmail and he has also won numerous awards for the selfless commitment he has made to the community. Through these efforts, he has attracted donations and sponsorships from many individuals as well as Liberty Promenade and Checkers. BAZ-ART too has now become a benefactor to ensure that his good deeds may continue to inspire the youth. Understanding firsthand how context played a role in where he found himself 5 years ago, Jeneker has now set out to change the narrative for the youth of Mitchell’s Plain. Through these art classes, he has afforded these kids an alternative, saving them from the same dire situation and giving them hope and something worthwhile to love up to. 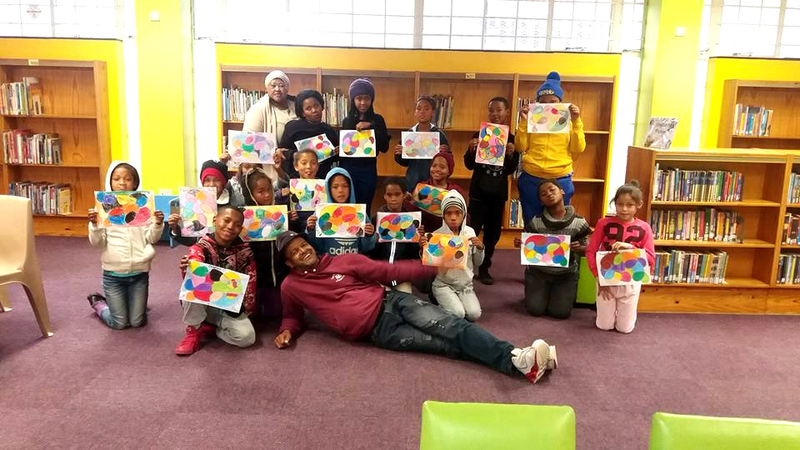 As libraries are used less and less each year, we would like to replicate and create similar spaces in at more libraries in South Africa! !